Today I'm sharing my latest makeover! I've had this bookcase in my garage for over a year now, and finally decided it was time for her overhaul! It's not like it started out that bad, but I saw a lot more potential. Plus any excuse to make sometime more my own always sounds good to me. So this piece was custom built out of alder wood. 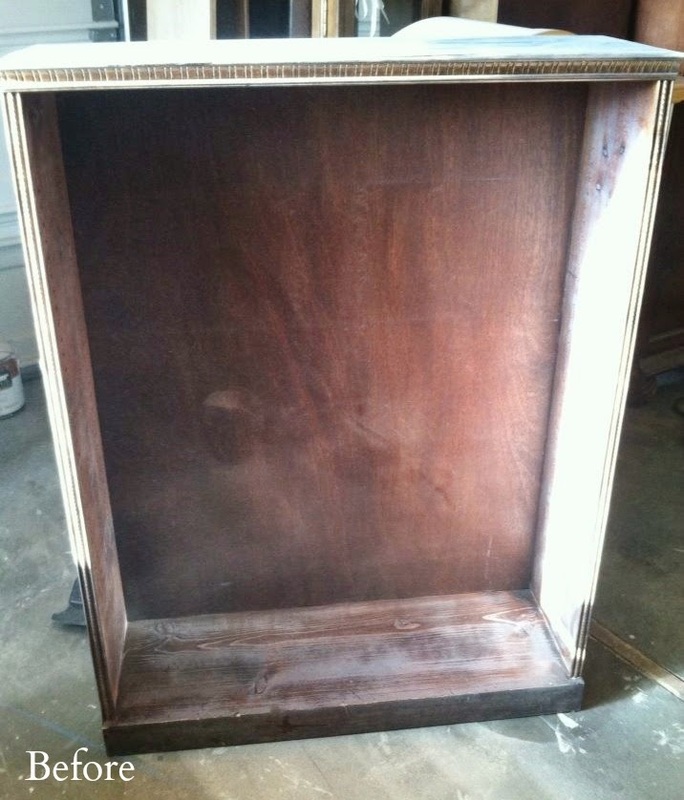 It has some lovey moldings to start with, and also features adjustable shelves. I didn't get a picture of the shelves, but they were just your standard 3/4" thick shelves. I personally love a more beefed up look ;) So I ran the shelves through my table saw and then pin nailed an 1 1/2" self edge to the fronts. So now the shelves look double the size and this was honestly so simple to do. I must admit, this was my first time using the table saw, all by myself, with no one around... I felt like such a big girl! haha. I just get nervous using that tool. Probably because everyone that has one has told me not to cut my fingers off. Way to freak me out people! After my shelves were complete, I decided I wanted an applique on here somewhere, so I simply just cut a 1x4 piece of pine to size, and pocket holed it into the top and sides. I applied wood glue as well for extra strength. Next I simply glued my applique on, and used my micro nail gun to secure it. Walla! Now we're talkin! I gave the whole thing a few coats of a gorgeous creamy white paint, did some distressing and sealed her up! Have you done some fun makeovers recently? I love making new creations out of boring things! Thanks for stopping by and have a great week!